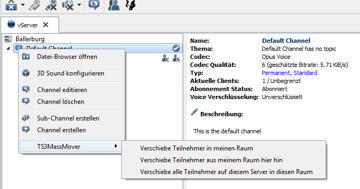 TS3MassMover is a Teamspeak 3 Client Plugin which adds short chat commands to move all clients from a channel or the whole virtual server to a specified channel. TS3Balloon creates a taskbar notification window like MSN Messenger on incoming chat messages. The window is on top of all windows and also works on minimized TS client.